What I do need is a clamping solution other than the Jay Bates inspired Moxon Vise that I made a little while ago, I need to be able to work on all faces of a work piece, so after seeing a Sjoberg Smart bench in Woodcraft I got to thinking of building my own since I didnt see alot of good reviews for the Smart Bench and it was kind of small and it cost like $150. This bench is awesome and so far love using it, I didn’t have a huge budget for it maybe $80.00 therefore couldn’t make the whole project out of hard maple with a contrasting hardwood, so I decided to build it using 2×4’s Kiln dried of course and I could use solid oak which I happened to have on hand . needed to buy some more. Didnt need to look pretty uoi would bever see it. 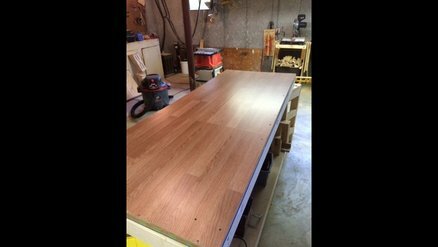 So I decided that I need to build myself a proper workbench NO MORE workhorses and doors….. I found a design online a website called Hammerzone, that all it took was some 4×2 AND OSB.. I'm tweaking the design in both size and materials as you can see in my Sketchup model. The frame will be built with 4×2 but the upper workbench will have 2 layers equaling about a 1” thick, the substrate layer will be 1/2” OSB and the work surface will be 3/4” MDF. The bottom shelf will be 1/2’ MDF. Since I've been used to working on a door , I am building the surface to be the same size 78” x 30”. Its huge but I got the space and sometimes I got 2 projects going simultaneously and I need the room. I knew eventually that after a year or so I needed to convert all the space in my workbench to useable storage space and I decided to GO ahead and design it and what I wanted to store. : I repurposed some 3/4” plywood for all the shelves and whatever scrap I had leftover from other projects.. 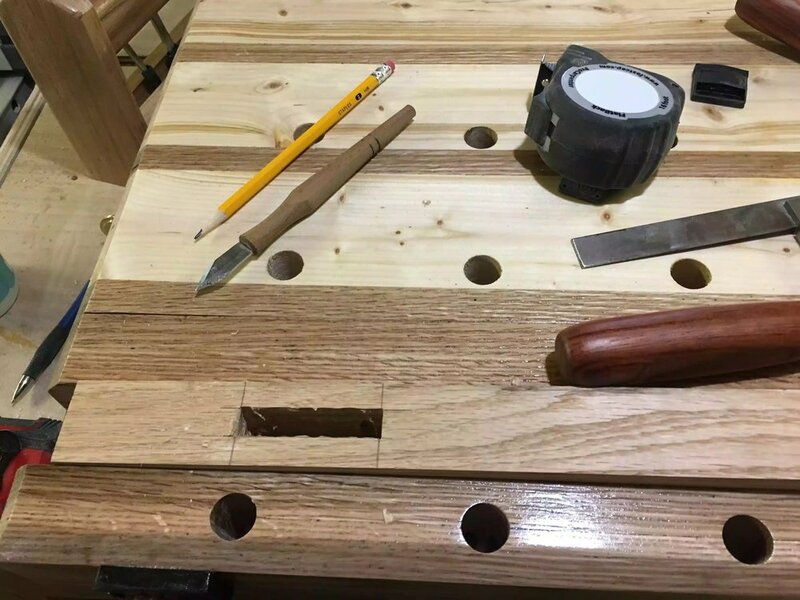 I used my Kreg K4 Pocket hole jig to join the frame together and supported it into the existing base and top of the workbench and glued it as well..
since I needed a lot of shelves and they also needed to be adjustable for future needs I used my shelf pin jig also from Kreg and they worked out awesome. I have to say for $40 this project turned out better than I expected and I also put all my stains,finishes and glues all within reach of my my main project assembly area..